Since the beginning of January I’ve had a chance to play with a nice tool called Deleaker. 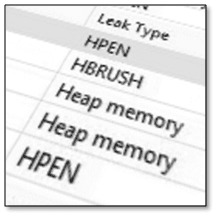 Its main role, as can be easily decoded, is to find leaks in your native applications. I often had problems creating and maintaining custom code that tracks leaks, so Deleaker seems to be a huge relief in those situations. Let’s see how it works and how can it help with native app development. Promotional note This review is sponsored. Still, the opinions expressed here are my own. supported Visual Studio 2005, 2008, 2010, 2012, 2013. VS2015 shouldn’t be a problem as well. 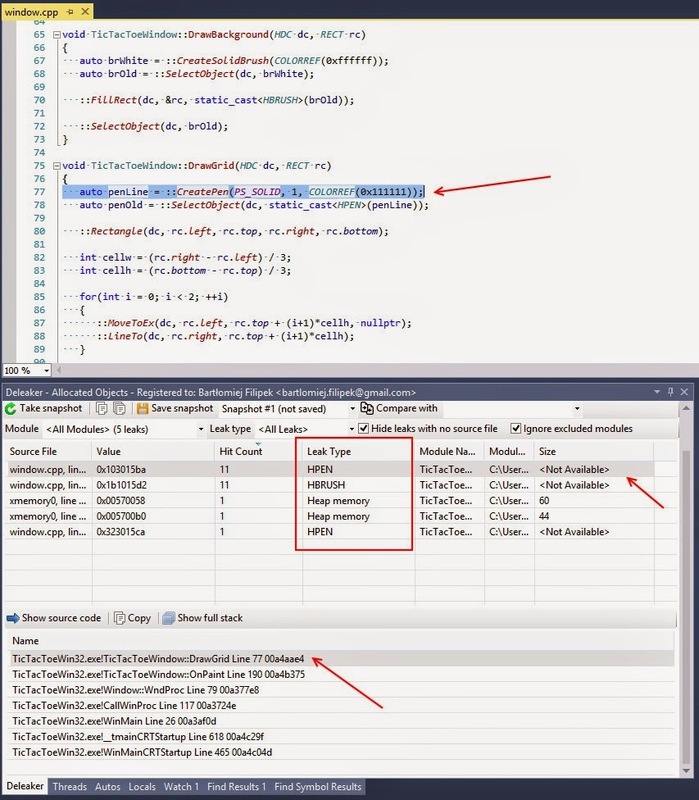 Type Can be used as an extension in Visual Studio or as a standalone application. Leak types Memory (new/delete, malloc…), GDI objects, User32 objects, Handles, File views, Fibres, Critical Sections, and even more. Other Gathers full call stack, ability to take snapshots, compare them, view source files related to an allocation. It’s quite simple: you have a list of resource allocations, with a source file, module, leak type, etc. Click on selected allocation and you will see its call stack. You can also double click on a call stack entry and go to a particular line of code that is responsible for the allocation. Basically, Deleaker hooks into every possible resource allocation function - like HeapAlloc, CreateFile, CreatePen, etc. and into its counterparts like HeapFree, CloseHandle, DeleteObject, etc. Every time your app performs an allocation the stack trace is being saved. While an application is running you can get a list of all allocations. When the app is closed Deleaker reports leaks that were not released to the system. Deleaker will store information about this particular memory allocation. When, at some point in the code, you use delete  tab; then Deleaker will record this as a proper memory deallocation - no leak will be reported. 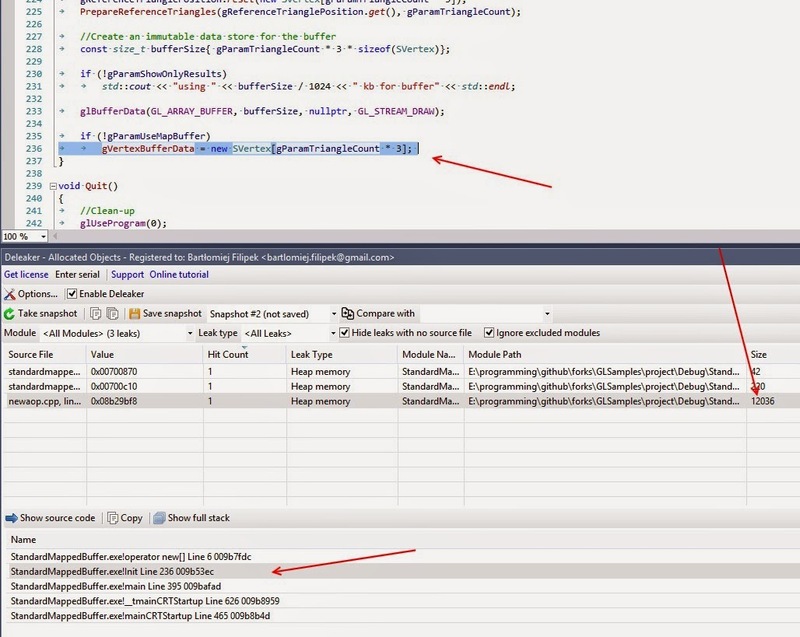 Let’s now test some code with Deleaker and then you will be able to see the tool in action. I’ve opened solution github/fenbf/GLSamples from my previous OpenGL sample. Then, I enabled Deleaker and simply ran it in Debug Mode. As we can see there is a whole range of small allocations (made by std and crt library) and two large allocations made explicitly by the app. The first buffer (stored in std::unique_ptr) is used to hold original positions for triangles. The second buffer (allocated using new ) stores temporary data that is computed every frame and then sent to GPU. You can click on the particular allocation and see its stack trace. Then, I closed the application using the “X” button. At the end another ‘snapshot’ is automatically saved that shows the leaks. On the list showed above, there is one interesting allocation that was not released. I simply forgot to use delete  gVertexBufferData!! The first buffer (for triangles) was properly deleted, because I used a smart pointer there. But the second buffer needs to be deleted explicitly. After looking at this problem more closely I figured out that that the buffer is destroyed when I press ESC key (in Quit function), but not when I use “X” window button (the Quit function is not called in that case). After that I need to ensure that my cleanup function will be called in any condition. Here we can see HPEN and HBRUSH objects that were used by the application. Deleaker looks for functions like CreatePen or CreateSolidBrush. After using Deleaker, I think, I can highly recommend this tool. In a few seconds you can get detailed reports from any kind of your native apps. All you have to do is to analyse it and fix the issues. It’s great to have a separate tool rather than custom code that may or may not work. Of course, It’s possible to write such solution on your own. Still, I haven’t seen many projects that do such tracking well. Additionally, if you change a project you have to spend additional time ‘copying’ (and adapting) that leak-test code from other projects. Other good solutions like VLD are very helpful (and free), but it can only track memory allocations. Deleaker hooks into almost every possible resource allocation function so it can track a lot more issues. User Interface that is very easy to learn. 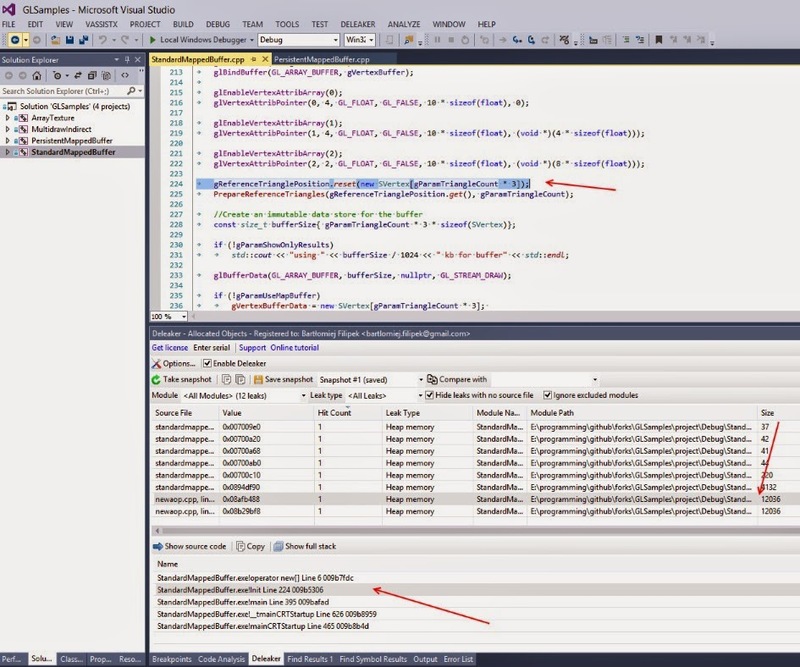 Works as Visual Studio extension window and as a standalone app. Fast response from the support! Sometimes you need to filter out leaks that comes not directly from your app: like CRT, std or even MFC. It would be nice to have a public list of leaks that were reported and looks strange. That way if you are not sure about your leak you would be able to see if that had been already reported.